We offer a delicious breakfast snack and fresh deli box lunch. We provide pick-up and drop-off near and around most hotels. Don’t see your meeting spot for pick up on the list? Please contact us at (866) 717-8687 to help arrange for transportation to a convenient meeting spot for pick-up. Our drivers care about you. Yes, our drivers and tour guides are professional, knowledgeable, and friendly. Free cancellation up to 24 hours from the start of tour. We DO NOT use a check-in terminal; we leave directly after hotel pickups. There are no additional fees on the day of tour. A restroom is located on the tour bus. Movies and entertainment are provided. Pick-ups will begin approximately 7:00 AM. P.S. – All times are approximate and are subject to change. Are food and beverages included in the Grand Canyon West rim bus tour? On our day trip to the Grand Canyon, a light breakfast snack and lunch are included. The water it’s on us. All you can drink! Tips are accepted and appreciated for a job well done. We suggest a 10% tip minimum, which is industry standard. Bring your camera to capture and preserve beautiful memories. A government-issued photo ID is required for all flight tours. Other helpful things to bring are beverages with a screw-on cap, sunscreen, sunglasses and cash or credit cards if you’re planning to purchase anything such as souvenirs! We recommend comfortable walking shoes, and, for the summer months, wear sunblock and hats for protection. Dressing in layers is also suggested as summer monsoon storms are common. For the winter months, dress in warm clothing. We offer free cancellation up to 24 hours from the start of the tour. Cancellations received less than 24 hours from the start of the tour will not be refunded. To be considered for a refund, please email custsvc@grandcanyondestinations.com. There is no fuel surcharge, and there are no other charges on the day of the tour. Prepare for an unforgettable trip to one of the greatest natural wonders of the world! From Las Vegas to the Grand Canyon West Rim and its famous Skywalk, Grand Canyon Destinations provides everything you need to make this journey a lasting memory that you’ll never forget! Our Grand Canyon tours from Las Vegas to the West Rim run from approximately 7:00 AM to 5:30 PM. The day of your Grand Canyon West Rim bus tour we will pick you up at your hotel between 7:00 and 8:00 AM. After a quick breakfast snack to help kick start the journey ahead, we will make our way to the first stop of the day at the Hoover Dam. On all of our Las Vegas to Grand Canyon tours, guests will have the opportunity to snap photos of this man-made wonder and marvel at the beauty of Lake Mead, a lake on the Colorado River known as the largest reservoir the United States. Soon we’ll be hitting the open road as our trip continues through the desert landscape on I-40. Our luxurious fleets come complete with air conditioning, panoramic windows, airline-style seating and so much more to make your ride as comfortable as can be! The Las Vegas to Grand Canyon distance to the West Rim is about 130 miles, but it will feel like nothing with our cozy seats and entertainment during your travels. In no time we will arrive at Grand Canyon West Rim home of the Hualapai Tribe and one of nature’s most incredible national landmarks. Grand Canyon West Rim tours start at the Welcome Center, guests will have up to four hours to experience the beautiful and extensive landscape of the Grand Canyon West Rim. For the most adrenaline-seeking thrillists, the option to take an exciting Grand Canyon helicopter ride will be the highlight of the trip. (Note: this can be arranged with or without a pontoon boat ride and prices are separate from Grand Canyon tour). 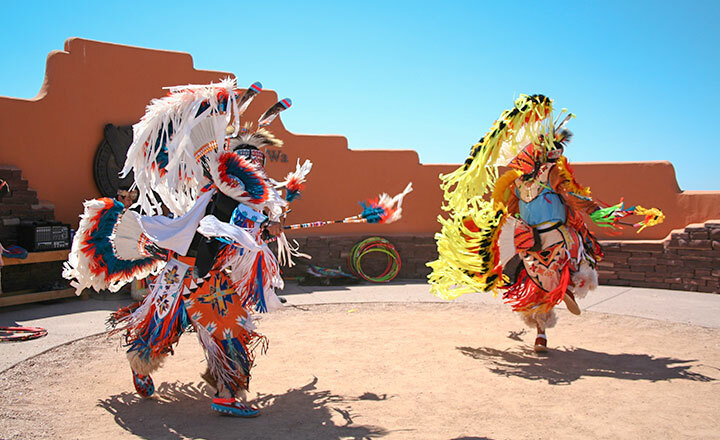 For those who would like to have a more leisurely experience, there is a shuttle to transport guests to Eagle Point, which boasts spectacular views and a Native American Indian Village. Last but not least, the most spectacular views come from the Skywalk. 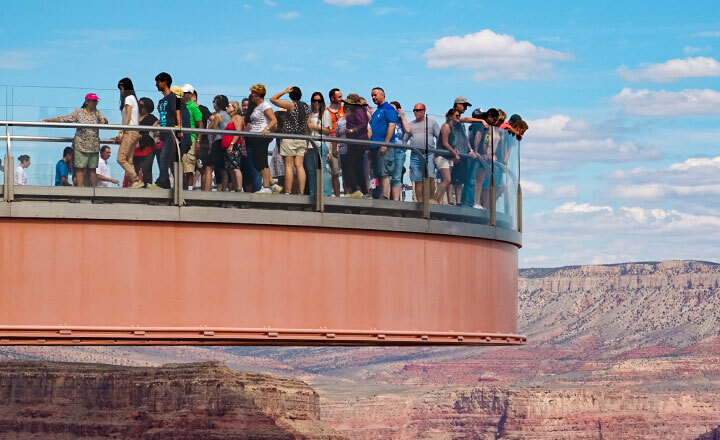 This glass-framed overlook sits 4,000 feet above the Grand Canyon and boasts a 10-foot-wide, horseshoe-shaped glass bridge peering over the West Rim of the canyon. Feel like you’re floating on air with this view! (Note: the Skywalk ticket is separate from the tour price). A Grand Canyon West Rim tour with Skywalk tickets will be sure to complete your experience and ensure you see the most iconic site while at the West Rim. With all the incredible sights here, your Grand Canyon West Rim pictures will capture the natural beauty of the canyon, the Colorado River, as well as the impressive Skywalk bridge just to name a few. 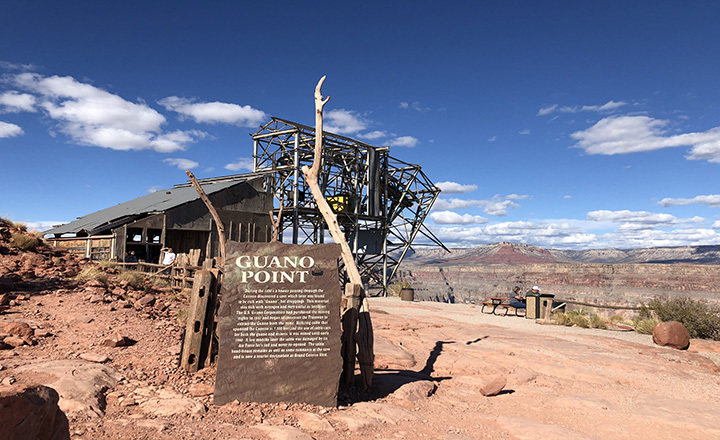 The second stop is Guano Point, a lookout that Hollywood films new and old have depicted countless times for blockbuster views. Live life on the edge at this lookout, offering one of the most dramatic viewpoints in all the Grand Canyon. Visit the remnants of a historic tram that once stretched 8,800 feet across the canyon to a Guano mine, grab a bite to eat at Guano Deli, or sift through Native American jewelry and crafts at the Hualapai Market. After Guano Point, the tour group heads back to the Welcome Center to make the last trip home to Las Vegas for the day. Driving back at the end of the tour, the distance from Grand Canyon to Las Vegas will be easily travelled as you sit back, relax, or sleep while your bus driver takes care of everything. Guests can plan for a hotel drop-off time sometime between 5:30 PM and 6:30 PM. After a fun-filled day exploring with Grand Canyon Destinations, we think you will agree that the West Rim Grand Canyon tour is an experience of a lifetime at one of the most incredible places on the planet! 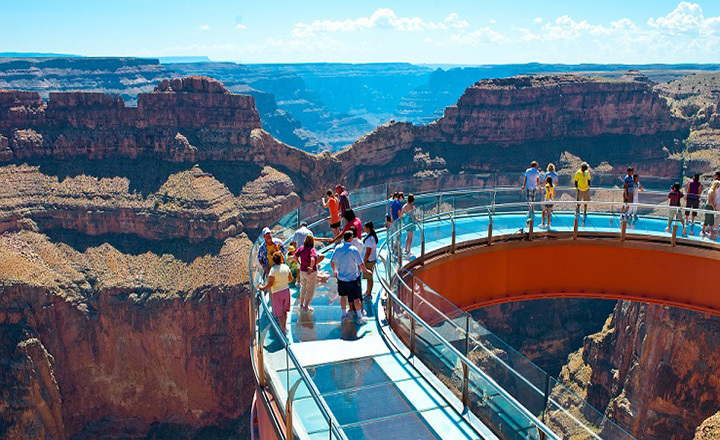 We offer more Grand Canyon Skywalk tours from Las Vegas, NV. Don’t forget to Tweet about this tour and tag us on your Instagram posts. We love videos too!